Just steps from the Pacific Ocean, the Novotel offers a superb beachfront location with stunning views of the ocean and the mountains. 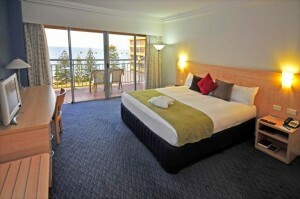 A 4 star hotel with accommodation rooms to suit all needs. This rate includes complimentary parking. The legendary Buffet Breakfast in the Windjammers restaurant is also available at a discounted price of $25.00 per person (normally $32.00). For those wishing to extend their stay this special accommodation rate has been made available for Tuesday 28 February & Friday 3 & Saturday 4 March.